The first Freddie Hubbard album released on Creed Taylor CTI label marked a shift away from Hubbard's recording with Blue Note Records. It was the album that established Taylor's vision for the music that was to appear on his labels in the coming decade. 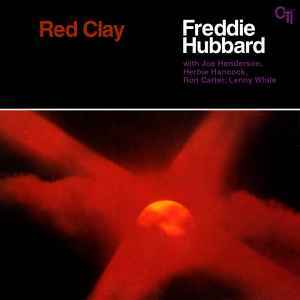 "Red Clay" is Freddie Hubbard's seventeenth overall album. This release initially had four tracks, the first CD reissue saw the addition of a fifth, "Cold Turkey" (recorded during the same session), while the remastering, issued in 2001 and subsequent releases, have one more bonus track which is a live version of "Red Clay" recorded at the Southgate Palace on July 19, 1971. I have a version in which the gatefold is Freddie Hubbards "Straight Life" glued inside. Anyone ever hear of this mistake? 2008 Rhino/Scorpio repressing. Mastered by David Cheppa at Better Quality Sound. Pressed by Rainbo Records. I have the 2013 black vinyl version 33 rpm mastered by B. Grundman. Nice analogue mastering. This is also an ORG release and I can't even begin to describe the amazing sound coming out of these Barnes & Noble exclusives. If you're a fan of jazz you will appreciate the quality of these releases. B&N is quickly becoming my goto for consistent quality. jazz vinyl. They're pressing special limited edition runs of groundbreaking jazz albums, mastered AAA by Bernie Grundman. Hopefully that's all I have to say in lieu of describing the sound. I have Thelonius Monk-Underground, Chet Baker-Chet Is Back and this Red Clay reissue and they are all top notch and bring new life to the music. I have two versions of this album. One album has a black and white picture of clay inside the gatefold sleeve. The other has the same picture except it's red. Both are labeled CTI 6001. Does anyone know which pressings there are? I just bought a reprint. It was ceiled. It has no barcode and is probably that one, but it's not gatefold. Anyone confirming, or is that another version ? Classic Album, due to track 1! The title track Red Clay is now considered a "standard" by jazz musicians worldwide. It has been covered many times. Many versions are good, but this version is to me the definitive recording of Red Clay. It offers wonderfully musical solos from each instrumentalist, highlighting the top class line-up. The rest of the LP is good quality jazz and reasonably listen-able, but not nearly as inspiring IMO.